XS904 first flew on 26th August 1966 and started her RAF life with 11 Squadron in April 1967. Apart from brief periods with 5 Squadron and in storage or on overhaul, she spent her entire career with 11 Squadron. With the type's retirement from service she continued to fly with BAe on Tornado F3 Radar Development trials. Finally retired in late 1992, she was acquired by the Lightning Preservation Group at Bruntingthorpe and flown there on 21st January 1993. The LPG do a marvellous job of keeping her and her stable mate XR728 in running condition and she's seen here returning from a twilight fast taxi run at a QRA event at Bruntingthorpe. The aerodrome is open every Sunday for visitors to take a look around the collection of historic aircraft - well worth a visit. 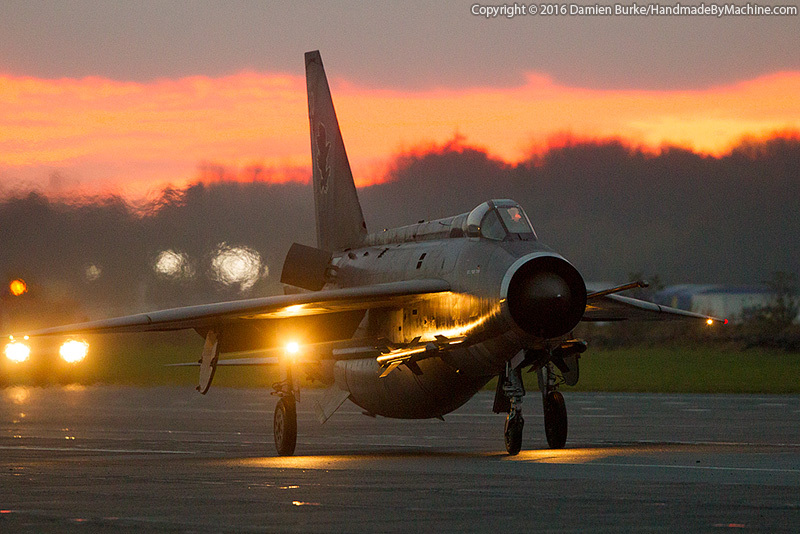 Keep an eye on the Lightning Preservation Group website for details of special event dates including taxi run days.